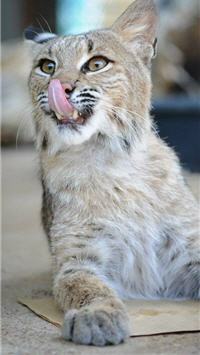 Meet Jasper, an adult male bobcat who apparently was a pet in Plano, Texas, who escaped into the community. For about a month, residents of this community reported seeing a very large cat prowling around their neighborhood, no doubt in search of food, water, and shelter. Our elusive bobcat was able to evade capture for quite a while until one day he was spotted and captured by Plano Animal Control. 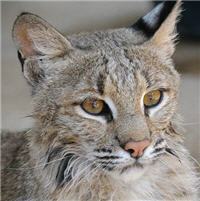 He was taken to the Plano ISD Holifield Science Learning Center, so Tammy Welch could find an appropriate home for the bobcat seeing how no one came forward to report a missing bobcat. Last week, Tammy contacted us and asked if we would accept this homeless exotic cat. Our first reaction to the request was “no” because we did not have a permanent open enclosure for him. Then we learned a little more about this boy which resulted in us accepting the little wild cat. We knew that finding a good home for this animal would be tough because Jasper displayed a fiery temper when scared or angry. One minute this cat would coo and caw at the Science Learning Center’s staff and then his attitude would change on a dime; screaming and lunging with such ferocity and force at anyone who approached him. We decided to accept Jasper as we have high hopes of integrating him with Moses and Otis once he has completed his mandatory quarantine period. Integrating Jasper with the boys will be a slow process: First, he will enjoy short visits with the boys, from inside a wire cage. Then, depending on how well he gets along with them, we will allow him to mingle with the boys. We plan on spending the first night with the three bobcats once they are living together, just to make sure everyone gets along okay.